Even the media frequently mistakes the difference between Faster-Than-Light (FTL), Hyperspace, and Voidspace travel. Some of this confusion is due to common language uses, and the fact that Voidspace travel is relatively new and misunderstood. Without going too far into technical difference, here's a brief description of each. Faster-Than-Light (FTL) Travel is still only a theory. Traditional space travel involves sub-light (SL) movement between two points. That's how people have been traveling for millennia, and it's still the best way to cover short distances. Before the discovery of Hyperspace transport, scientists believed interstellar travel was at best impractical due to the hard limits of light speed, and Einstein's special theory of relativity, which states that objects that approach the speed of light 'slow down' in relative time, even as time progresses normally around them. So a fellow stepping onto a spacecraft for a round-trip of ten light years would think his journey to be nearly instantaneous, but meanwhile ten years would have passed back home. Scientists are still attempting to harness tachyon particles - tiny bits of energy that have still not been proven to exist, which are believed to travel faster than the speed of light - for use in communication systems. Should this system actually work, it could prove quite a change to human society, as these particles could actually arrive at their destination before they were sent, assuming Einstein's special theory holds beyond light speed. Hyperspace Travel was discovered just over one hundred years ago, and has been responsible for the colonization of space. Hyperspace Travel has been referred to as a "Galactic Freeway." It is a parallel dimension of space analogous to our own as the sky is to a mountain range. You can cross a mountain on foot - like we travel through normal space - or you could hop into an air-car and skip the mountain entirely. To somebody who can't see the sky, it would appear as if you simply disappeared from one spot, and reappeared on another on the opposite side of the mountain. 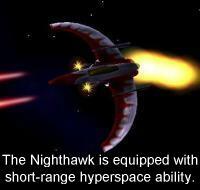 The problem with Hyperspace travel is that it is very expensive, and also somewhat unpredictable. While the energy requirements are much less than it would take to cross space through conventional means, it still takes an enormous amount of energy to project a ship through hyperspace. Navigation is very difficult, which means the arrival point is never guaranteed. The margin of error increases based upon the distance traveled, so a ship traveling 20 light years' distance could be off by as much as a full light year upon its arrival. In deep space, this is not much of a concern, but it brings with it a risk of arriving in a space occupied by, say, a planet or small star. For safety reasons, then, most ships travel through hyperspace in a series of shorter 'hops'. Prior to the discovery of Voidspace, communications were still limited to the speed of light. This meant that it was much faster to send a message via a courier ship than to broadcast it to even a nearby star. Thirty years ago, a scientist named Ethan Blade discovered the existence of Void Points (and, arguably, Voidspace*). If Hyperspace is analogous to the sky above a mountain range, Void Points are a network of tunnels going through the mountains. Space is frequently referred to as a 'void,' but in reality it is filled with innumerable particles and forces, many of which we did not even know existed until just a few years ago. Voidspace is another 'parallel region' of space, another dimension if you will, where virtually none of these forces and elements exist. Even the laws of physics, as they are understood in normal space, no longer apply or are greatly mutated. An object in Voidspace can literally drift across the galaxy in a matter of hours, using little more energy that a ship might use to fly from Earth to the moon. The problem is that traveling between Voidspace and normal space is an entirely different matter. Under normal circumstances, the amount of energy required is equal to that output by a large star. In fact, that is exactly what happens with a 'black hole' - the incredibly concentrated gravitational force punches a permanent hole between the normal space and Voidspace. Unfortunately, that same force is unbelievably destructive to anything even approaching a black hole, so these natural openings are useless for any sort of practical purpose. The benefits of Voidspace transportation are clear - compared even to hyperspace travel, Voidspace travel is several orders of magnitude faster and cheaper. However, the limited number of void points means that many destinations lay far beyond their nearest void point, requiring hyperspace travel for that leg of the journey. * Some scientists debate whether or not Dr. Blade actually discovered Voidspace, as he did not document his findings adequately and there is no proof that he used or was even aware of Voidspace. 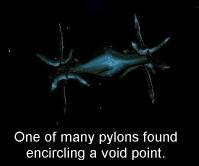 However, most scholars agree that the arrangement of pylons around the Voidpoints to facilitate Voidspace travel could not have been an accident. 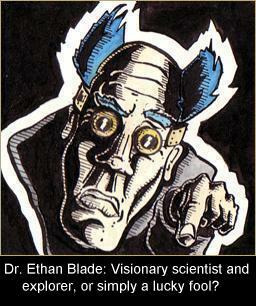 Still, groups anxious to promote the accomplishments of their own members are quick to point out that Ethan's failure to provide documentation of his own discoveries amounts to his work being nothing more than the happy accidents of a madman, and that the title of "father of Voidspace" should be given to another who followed proper procedure. ** Again, certain parties complain bitterly if any assumption is made that Ethan Blade found and marked void points by any means other than pure random chance. *** After much bitter warfare for ownership. **** Two additional void points were found that proved to be unstable, disappearing within months of discovery. There have been several unconfirmed reports of discoveries of void points of even shorter longevity, disappearing before their existence could be independently verified.